Fleas are not just an irritating nuisance, but can cause numerous problems for pets ranging from minor to life-threatening. Not only are these parasites good at causing severe itching, irritation, and allergies, but they can also transmit tapeworms and other diseases. Fleas love to infest dogs, cats, ferrets, mice, rats, and also enjoy biting people, too! For more information, please click on the link below and read the "Fleas: Know your Enemy" article from a veterinary partner. No one wants these blood-sucking parasites and their maggots in their home or on their pets. We can help keep them away, or help you get rid of them if they’ve already found their way inside! Call us to find out how to eliminate and control fleas and start your pet on a preventive today! 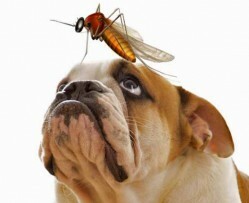 When they bite, mosquitoes can transmit a number of different diseases, including heartworm infection. Heartworms affect both dogs and cats and these parasites can severely, and sometimes fatally, damage the heart, lungs, and blood vessels. Some pets may not show any signs of infection but for those that do, symptoms can vary widely. Cats were often thought to not be susceptible to heartworm infection, however, they can indeed get the disease. In feline heartworm disease, they can develop a serious syndrome referred to as heartworm-associated respiratory disease (HARD). Symptoms can be subtle or severe including signs of respiratory distress, such as rapid or difficult breathing, wheezing, and panting, are common. It can also mimic asthma or allergic bronchitis in other cases. Other symptoms include coughing,vomiting (typically unrelated to eating), and loss of appetite or weight. Heartworm infection is more difficult to diagnose in cats than it is in dogs and currently there is no approved treatment for cats. Some cats can spontaneously rid themselves of the infection; others might not survive it due to overwhelming inflammation in their lungs. It takes only one or two adult heartworms in a cat to cause serious life threatening problems. Fortunately, there’s an easy way to keep your dog or cat safe: by administering monthly heartworm preventives. Most heartworm medications also protect your pet against other parasites, such as roundworms, hookworms, whipworms, ear mites, fleas, and ticks. The products range from oral formulations to topical. Please call our office and we can recommend the best prevention plan for your pet today! Ticks are becoming more and more prevalent in North America, and they’re slowly moving into areas where people and pets didn’t previously encounter ticks. These parasites aren’t just a nuisance; they can cause serious, and sometimes deadly, diseases, including Lyme disease, Rocky Mountain spotted fever, babesiosis, ehrlichiosis, tick paralysis and bartonella. Contact our office immediately if your pet starts showing signs of coughing or has joint pain, trouble breathing, fever, weakness, or loss of appetite, weight, energy, or coordination. These symptoms could be a sign of tick exposure in your beloved companion. When talking about diseases spread by ticks, it is important to remember that an ounce of prevention is worth a pound of cure. The best method for preventing tick born disease from developing in your pet is by keeping your dog or cat on a monthly tick preventive. Don't forget that indoor-only pets are at risk as well because ticks can hitch a ride inside on your clothing or shoes. Tick preventives are safe and highly effective at controlling ticks and the diseases they carry. Many products offer concurrent flea prevention as well! Call us to get your pet protected today, and our team will help you decide which product is most compatible for your pet's lifestyle! If you find a tick on your dog or cat, even if your pet is on a preventive, don't panic!. Some preventives kill ticks after they’ve come in contact with your pet. Ticks can hide easily under your pet’s fur, in their ears, and between their toes. As an added measure of protection, we advise checking your pet for ticks every time they comes in from outside, especially if they have been out hiking or playing in wooded areas with you.